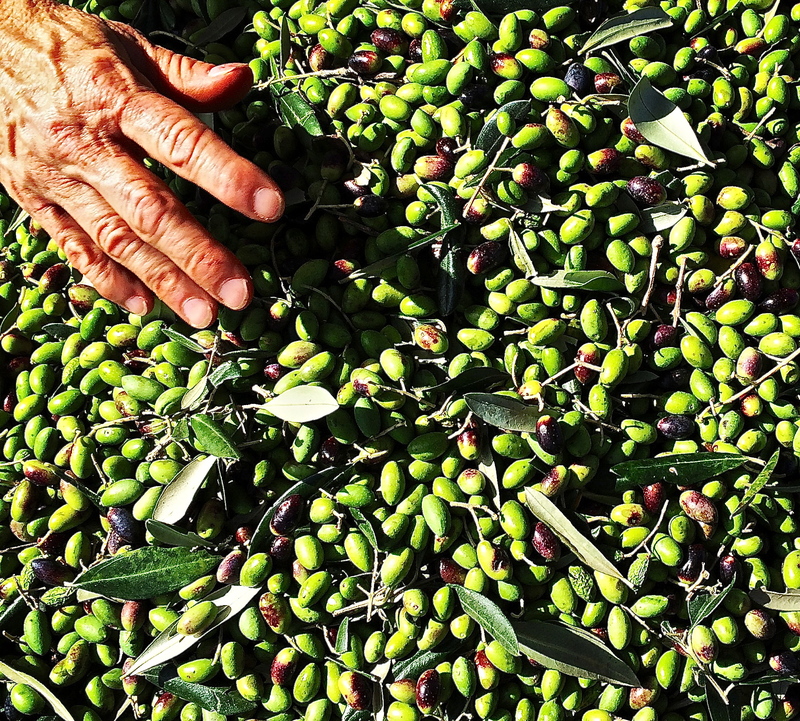 Maybe you’ve been following the Italian and Spanish olive harvest news this year. If so, it won’t come as a surprise that 2014 will be remembered as one of the worst years in history for premium olive oil. For a variety of reasons, olive oil production is down by as much as 40% overall in Italy this year. And for premium extra virgin and organic olive oils, the situation is even worse. During last year’s harvest (2013), the mill was packed with crates of olives just like these stacked 10-15 high. Milling reservations were required well in advance and the mill worked through the night for months on end. During the 2014 harvest, the mill looked like this: very few olive crates and even fewer people. “La natura non si governa” (“You can’t control nature”) is what our miller told us darkly. Some years you win and some you lose. Last year, the combination of a mild winter and violent hailstorms in the spring made it difficult for pollination to take place, reducing olive yields significantly. And things only got worse as the harvest limped along due to an unprecedented infestation of Bactrocera oleae or olive fly. We’ve never seen so few olives on the trees and olive mills so empty here. The economic impact on the world’s second largest olive oil producer is devastating, particularly considering the pain of Italy’s ongoing recession. We have a ringside seat to watch the impact up close in the faces of the farmers and millers we know. And we’re feeling the pinch in a very big way, too. We harvested in mid-October, avoiding olive fly infestation, but yields were so low that we finished in just a few days. What does all this mean for Pascarosa, our fledgling organic olive oil export business? Our own organic grove produced less than 20% of its capacity this year. 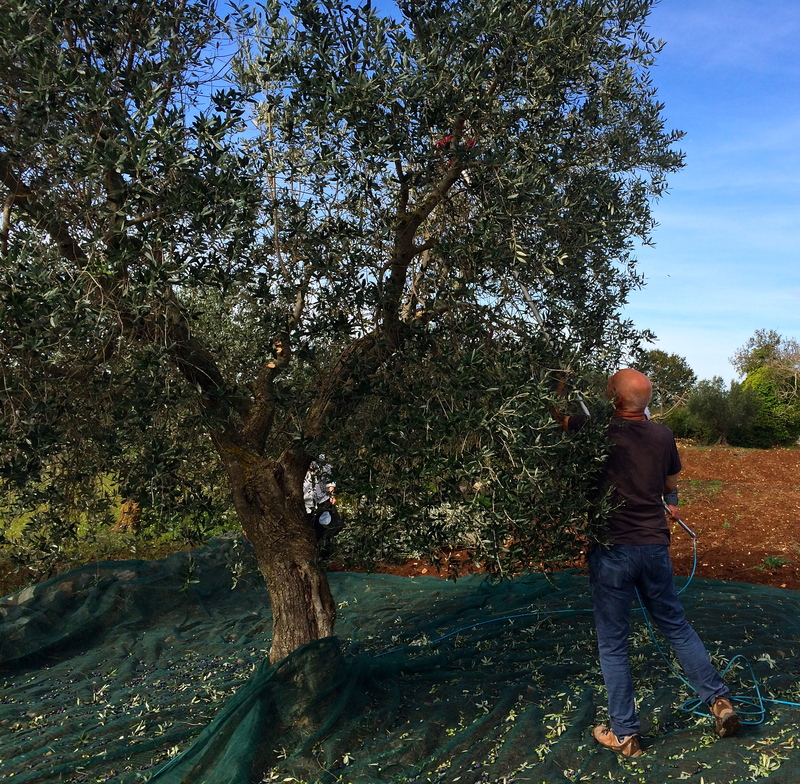 Even in good years, we don’t have enough trees to supply the demand for Pascarosa, so we buy olives from neighbors here who farm the way we do to bridge the gap. But everyone else was in exactly the same boat, with no extra olives available for purchase. 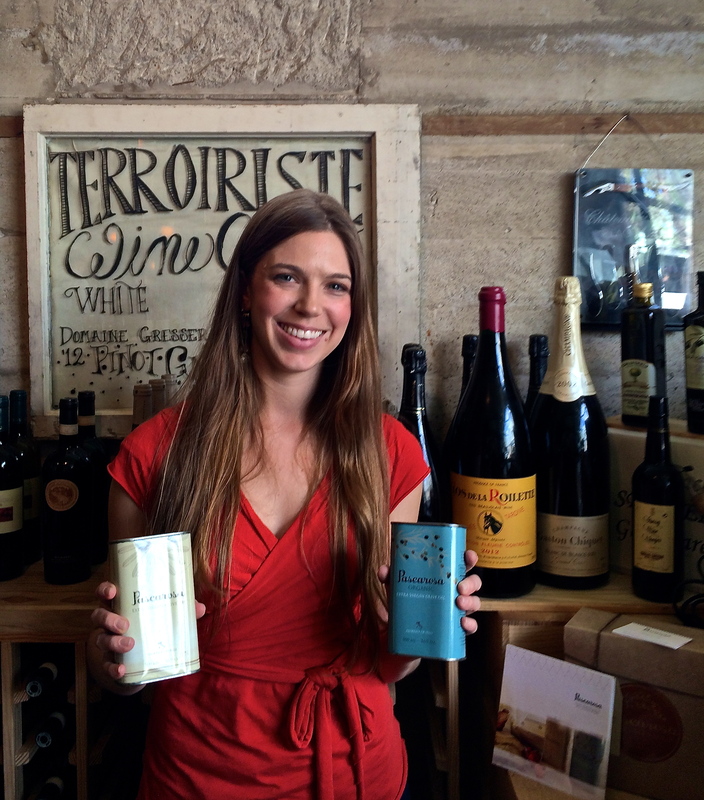 These olive oils sell for less than $8 a liter. In a year like this one (or just about any other year, really), know that it is extremely unlikely that you’re getting bona fide extra virgin olive oil from Italy at this price. It is more likely highly refined olive oil made comestible by using chemical purifying agents. The resulting oil has extremely low antioxidant levels, a greasy mouth feel and very little flavor (Photo credit: http://www.thekitchn.com). When we started out, we made some inviolable agreements with ourselves about quality. 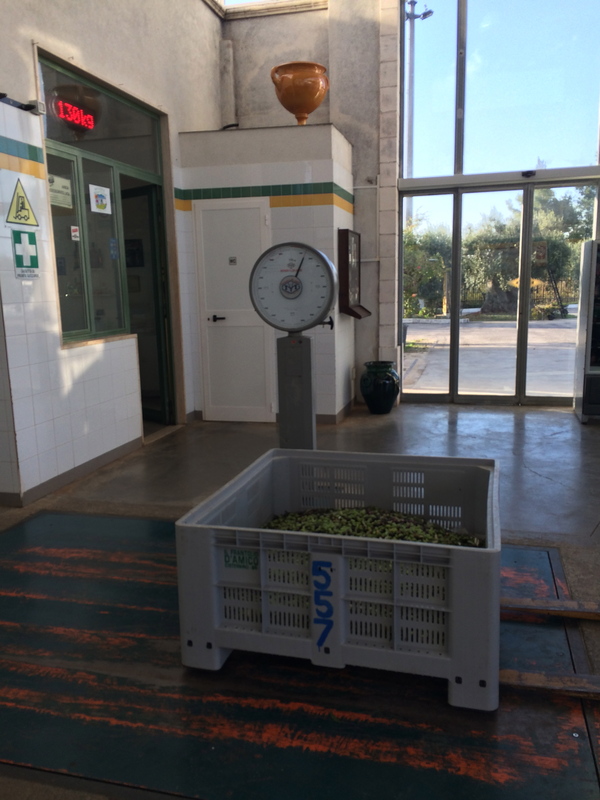 We feel strongly about supporting traditional, sustainable farming and harvesting practices to yield first rate olives for the olive oil we export. What we have seen on the market thus far this year is far from that high standard. The situation is particularly dire for certified organic and sustainably grown olive oils because virtually the only olives that survived this year were heavily sprayed with the pesticide used to counteract the olive fly. 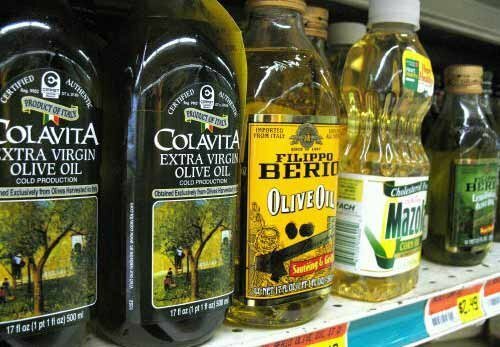 You’ll see olive oil from Spain and Italy on store shelves this year that claims to be extra virgin, but we urge you to be very, very careful about what you buy. Along with other producers of premium quality extra virgin olive oil like Tenuta di Capezzana in Tuscany, we have made the hard decision not to export olive oil this year. After rejecting more substandard olives and olive oil than you can imagine, we returned to our original commitment to export only the very best. Sadly, there just isn’t much “best” around right now. A foot of snow will help reduce the olive fly population next year, so we welcomed the surprise storm with open arms. 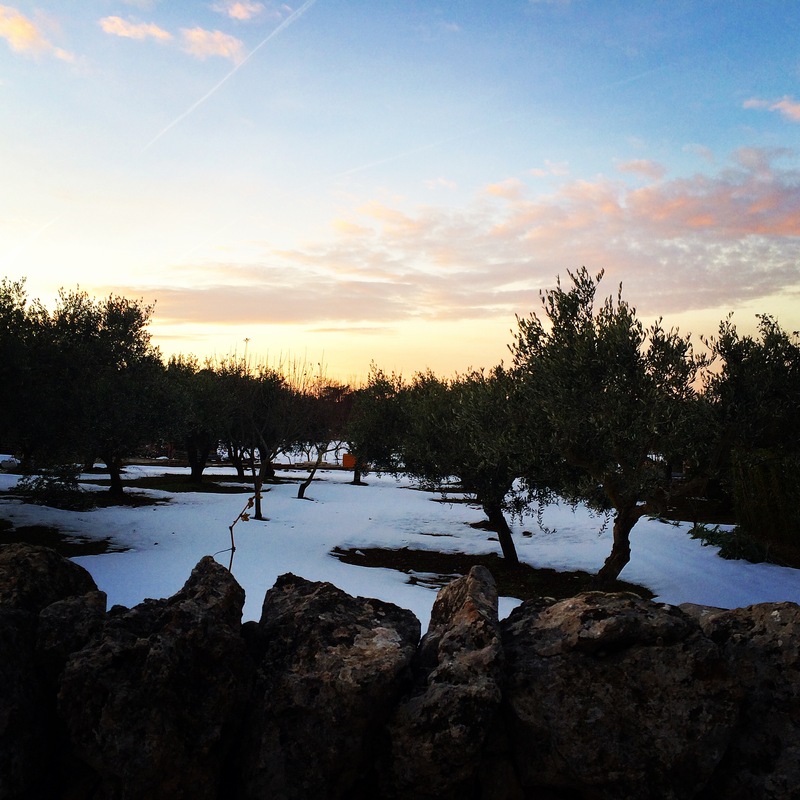 If there is any good news to report, it is this: in Puglia, more than a foot of snow fell on New Year’s Eve accompanied by several weeks of freezing temperatures at night. This will help kill the olive fly larvae that live in the soil, which didn’t happen last winter. We also took advantage of the slow harvest season to prune our trees, ensuring good yields in future years, weather permitting. Our supporters are hanging with us for the long haul, preferring to wait a year for great oil than settle for less than perfect oil at a higher price. We love them for it. And the best news of all? Our Pascarosa supporters have let us know that they prefer our decision to wait out the year rather than raise prices or compromise our quality. Their understanding has made it possible for us to weather the storm with a glimmer of hope for next year. In the meantime, we’re invoking every spiritual entity we can think of to influence a great outcome for the 2015 harvest to yield the extraordinary olive oil we love so much. Cheesy, gooey, deeply flavorful spinach and Gorgonzola pasta is a sophisticated mac and cheese with serious comforting capabilities. Since we’ve made this tough decision, we’re drowning ourselves in as much comfort as we can find. Long walks in the Valle d’Itria countryside, intense planning for our fall food and wine tours and next year’s harvest and lots of cooking that evokes warmth, care and kindness during these chilly winter months are our antidote. 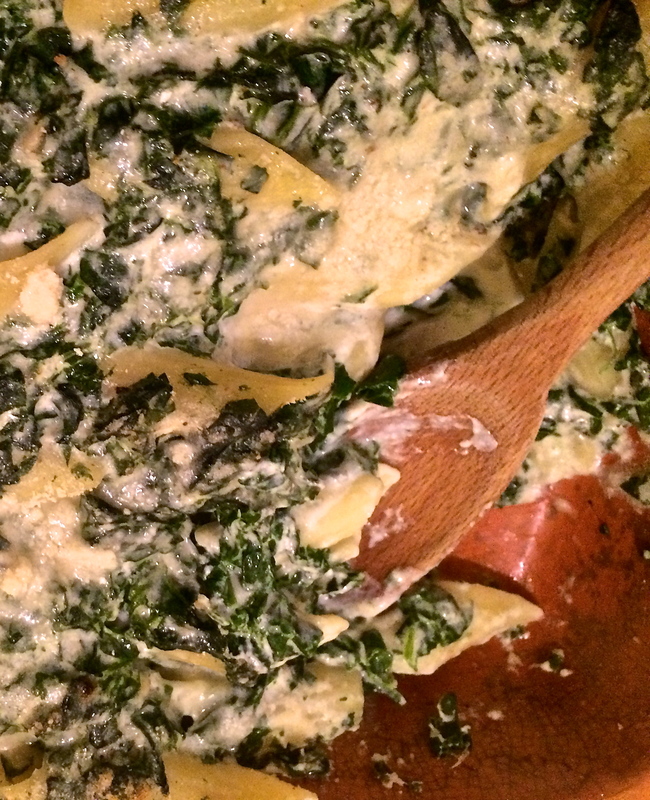 The sometimes-melancholy mood caused me to resurrect a dish called spinach and Gorgonzola pasta, a family favorite from Santa Cruz, California landmark, Gayle’s Bakery and Rosticceria. Of course it’s pasta, because pasta’s psychic healing power is well established. I’ve always wanted to figure out how to make this dish, but several previous attempts fell short of the mark. This time I think I’ve cracked it. I promise that it is everything I hoped it would be. And we can attest to its curative powers. We are feeling so much better already. And did you notice? Olive oil is absent from the ingredient list. Penne rigate (pasta tubes with ridges) are the ideal shape for this creamy baked pasta, but conchiglie (shells) and farfalle (bowties) work well, too. 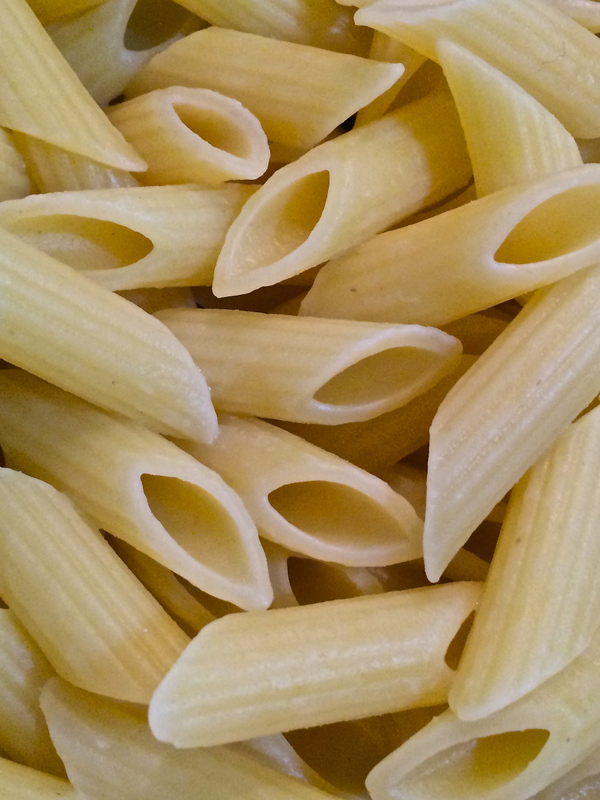 These penne rigate are from Benedetto Cavalieri in Maglie (Lecce). They hold up beautifully for baked pasta, retaining their flavor and shape throughout the process. Heat the milk until you see small bubbles and a little steam, making sure not to boil it. 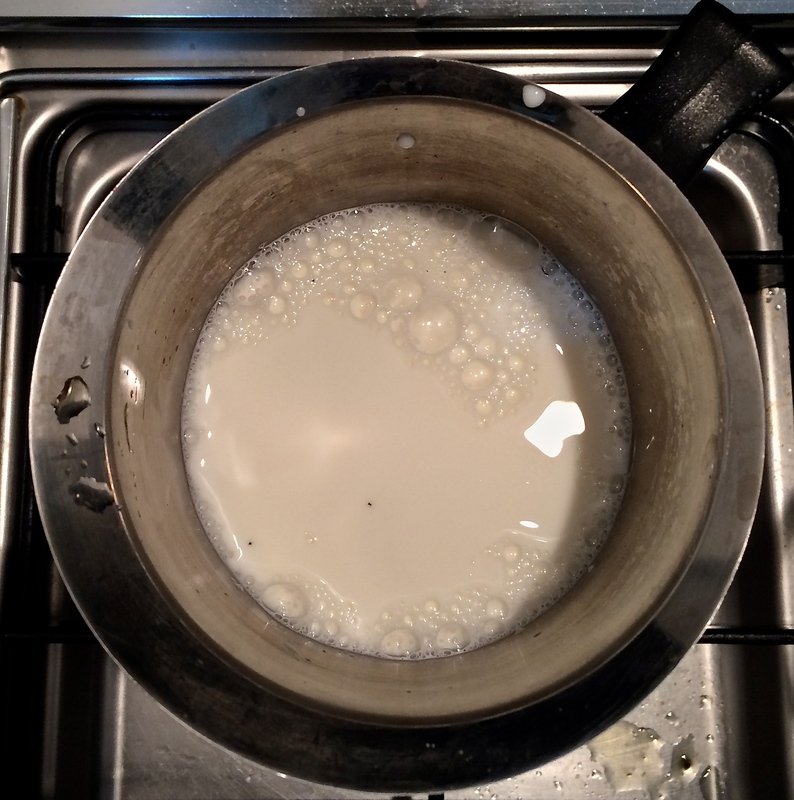 In a heavy saucepan over medium heat, heat milk until hot but make sure you don’t boil it. Meanwhile, make the béchamel sauce. Melt the butter in another heavy saucepan. When it is melted, sprinkle the flour into the butter and combine flour and butter well with a whisk. Continue to stir over medium heat with a whisk (or a wooden spoon once you have thoroughly amalgamated the flour and butter) until the mixture has simmered for a few minutes and the flour as lost its starchy taste. Be sure to avoid browning the flour and butter at this stage. 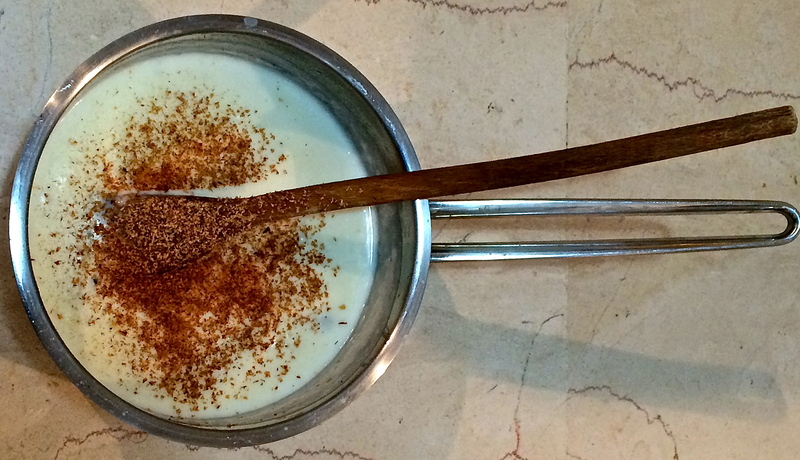 Remove the creamy béchamel from the heat and add the nutmeg. Slowly add the hot milk to the flour mixture a little at a time while whisking vigorously. Continue to add the milk until it is fully incorporated. Bring the mixture to a low boil, reduce the heat to low, and simmer, stirring constantly, until the mixture thickens, about 6 to 8 minutes, until it looks like heavy cream. Crumble the cheese and add it to the hot béchamel sauce, whisking continuously until smooth. Add the nutmeg and pepper and stir. Remove from heat and let cool. 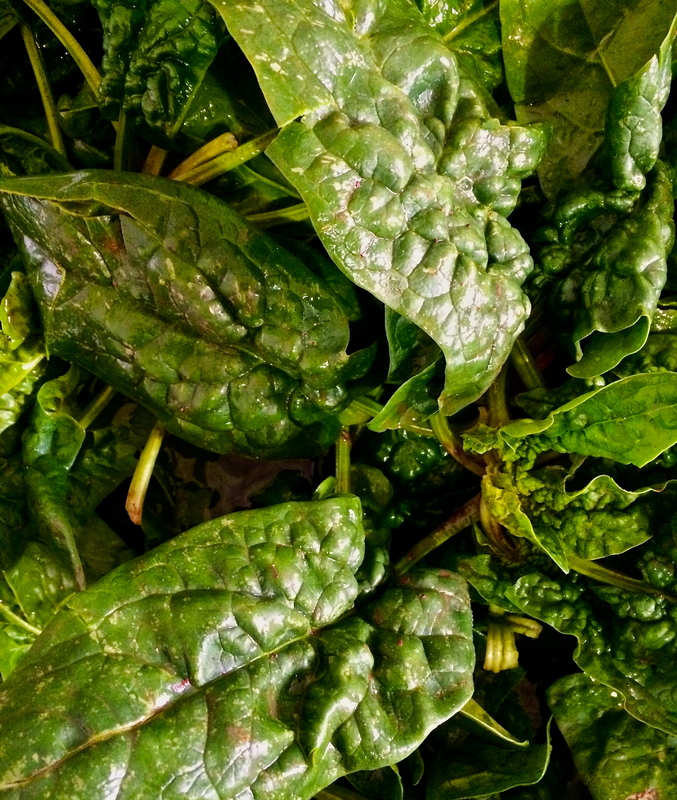 Submerge fresh spinach in a basin of cold water. Shake the leaves vigorously to remove sand and grit. Remove tough center stems. If using fresh spinach, remove the coarse stems from each leaf of spinach as you rinse it thoroughly to remove sand and dirt. Blanch the leaves for 1 to 2 minutes in a little boiling, salted water. Drain the spinach, let it cool, and squeeze all of the water out several times. Make sure you’ve removed all of the water at this stage. 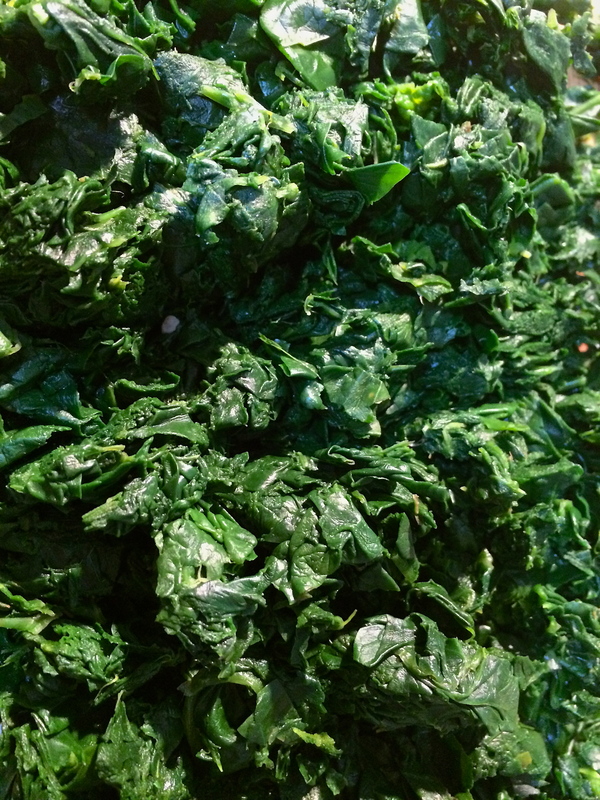 If you are using frozen spinach, let it defrost in a sieve over a bowl. Squeeze all the water out by hand. Roughly chop the spinach and set aside. Washed, deveined, blanched, drained and chopped spinach ready to add to spinach and gorgonzola pasta. Meanwhile, cook the pasta in salted boiling water for 6 to 8 minutes, making sure that it is quite al dente (there should be a little white core at the center of the pasta when you bite into it. Just before the pasta is ready to be drained, scoop out a few cups of the starchy pasta water and reserve. Drain the pasta lightly and set aside. 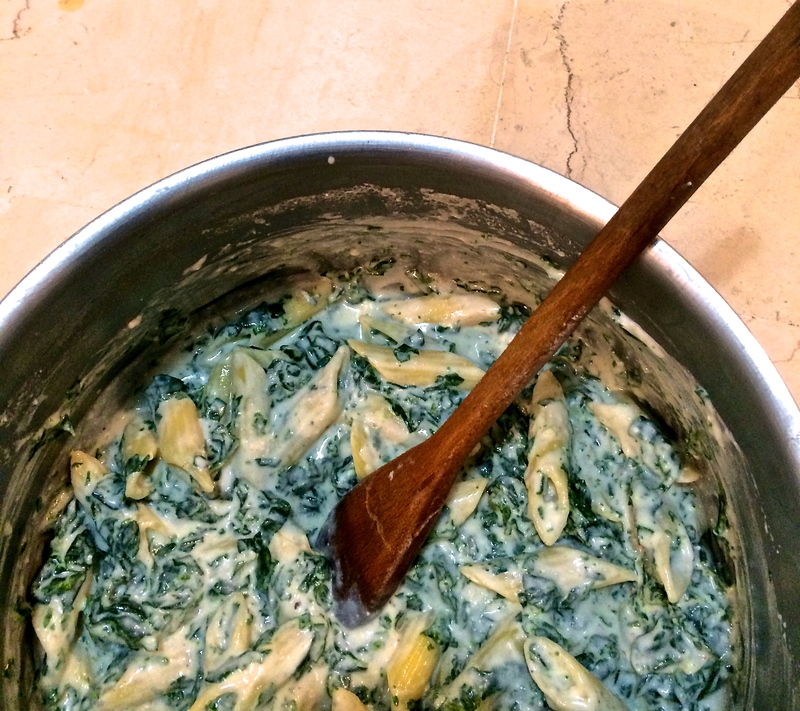 Toss the pasta, Gorgonzola sauce, spinach, ricotta, three quarters of the Parmesan cheese and the minced garlic in a large bowl until well combined. At this point, add some of the reserved starch pasta water until you have a fairly soupy mixture of pasta and sauce. You made need as much as a cup and a half to two cups of water, but much depends on the pasta you’ve used. The pasta absorbs the liquid while it is baking, so the pasta water is essential if you want to make sure you have a creamy, gooey baked pasta at the end, Taste and correct for salt and pepper. Mix the drained pasta, spinach, béchamel with Gorgonzola, ricotta some of the Parmigiano and extra pasta cooking water to yield a soupy blend. Don’t worry if it seems too watery; the pasta absorbs much more liquid than you think. And if you don’t make the mix soupy, the resulting baked pasta will be too dry. 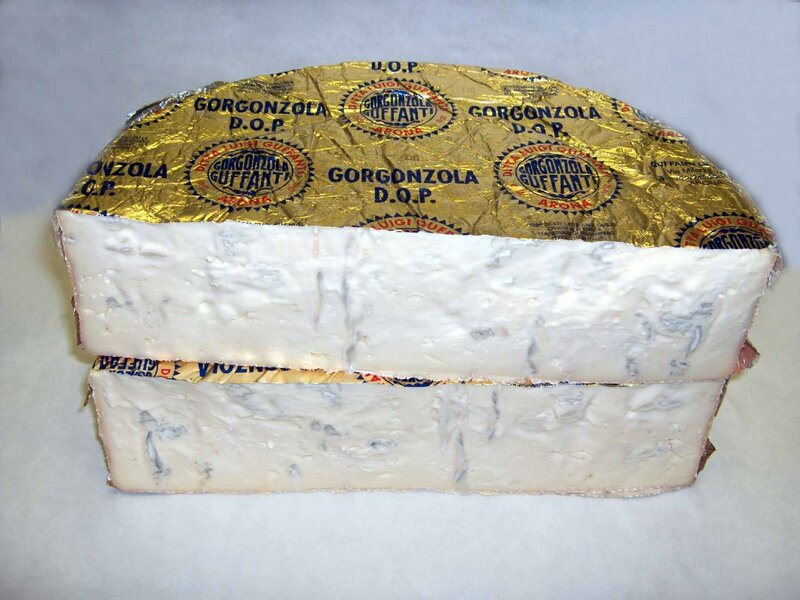 Place in a 12×17-inch casserole dish you have prepared with a film of extra virgin olive oil to reduce sticking and top with the rest of the Parmigiano cheese. Bake for 30 minutes or until the cheese browns a little. You can make this pasta ahead of time by assembling it to the point when you would bake it, then refrigerating it (covered) overnight. Bring to room temperature before baking, or place in a cold oven, then bake at 400 degrees for 45 minutes to an hour. The finished pasta bakes long enough to marry all of the flavors, creating a delicious cheesy crust. Makes 8 servings (or considerably less if you’re serving people who need extra comforting). So sorry to hear how much damage your olives have suffered this year. But, the recipe sounds great and I’ve given my wife a copy. Good luck for a great 2015 harvest harvest. Farming is tough, no matter what you are raising, so I applaud your decision to stick to your plan and product. Let’s hope next year works out well. I live about a mile and a half from Gayle’s; and have had the pasta when the need for comfort outweighs the calorie cost, soam very gad to have the recipe. Thanks for the post, im sorry you guys are having a tough time of it. I really respect your committment to quality and the difficult decision you had to make. Very admirable! The pasta looks fabulous! I dont have an oven in my little french kitchen. 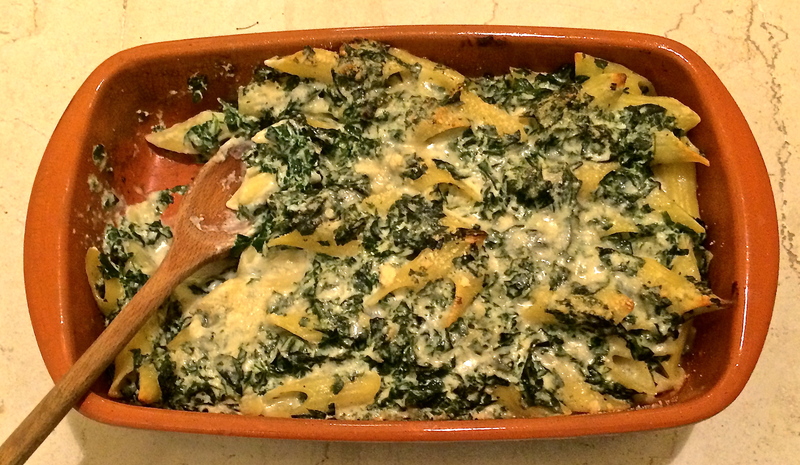 Do you think its possible to just do the bechamel and spinach and toss with the pasta, sans baking?? Cheers! Hi Sarah–Thanks for your very kind words! We’re hanging in and looking forward to the 2015 harvest, so stay tuned for great news (and keep your fingers crossed). As for the pasta, by all means, skip the baking step. Just adjust how much of the starchy pasta water you add to the mix. You still need some to keep things creamy, but not nearly as much as you need if you decide to bake it. Buon appetito! Thanks for the post, so sorry to hear about the rough harvest. Anyway i really admire your committment to quality over profit. It’s not an easy choice to make, and not many people have the strength to make it. So bravo!